Want to pretend you're a South African professional hunter but don't have an extra five figures lying around? As of Sept. 1, you can get close in Texas. You can lean a rifle out the window of a ground-buzzing helicopter and blast ... feral hogs. That's right. The mortal enemy of ranchers, farmers and other Texas landowners -- to the tune of more than $400 million annually in crop and other damage -- will soon be open to helicopter hunting by licensed hunters. Coyotes too, but feral hogs are by far the greater threat. They bust fences, sour water holes, uproot crops, cripple cattle and generally don't do a darn thing positive except taste good. Since 2005 the demand for blasting hogs has more than doubled while the number of coyotes landowners have asked the Texas Parks and Wildlife Department (TPWD) for permission to kill (coyotes can also be killed by helicopter) has stayed pretty constant. Texas hogs, all 2 million, are classified as a non-game, nuisance species, meaning they can be "taken by any means or methods at any time of year," states the Texas Department of Wildlife and Parks. No bag limits, but you need a hunting license. So far that has meant shooting them from the ground, a treestand or the highest you could get was a tower stand. Now you can get higher and faster in a helicopter, provided you have the $300 to $600 per hour (with a multi-hour minimum) it costs to rent a whirlybird. Even if many Texans could afford it, this doesn't mean you'll see hunters whizzing all over the state, looking for hogs. First are the facts that there aren't that many helos around, and it's probably a safe bet to assume helicopter operators aren't too psyched to allow anyone and everyone in their machines with loaded weapons: Jay Smith, a pilot and owner of Smith Helicopters, told The New York Times, "What we have to watch out for is the people that get in the helicopter with us and the way they handle the guns." Also, helicopter hunting favors the open country of south Texas, where the animals are more visible and helicopter pilots can get their machines closer to the ground. And since you're moving and so is the animal, it probably won't be easy to hit those critters. One fact might support this: TPWD data shows that it received more than 2 million requests to shoot hogs by helicopter since 2004, but less than 70,000 were taken. On the other hand, The Dallas Morning News reported that "a good shot on infested land can sometimes hit 350 feral hogs in a day" -- that word "hit" being the reason animal rightists opposed the bill. The sponsor of the bill, Rep. Sid Miller, R-Stephenville, also feels that helicopter hunting is all about the numbers. "We‚re not trying to make a sport of it," he told the paper. "It's the most effective way. It's about the only measure we have." Texas' feral hogs are a mix of European domestic hogs introduced by Spanish explorers 300 years ago, European wild hogs (also known as Russian boars) released in Texas by ranchers and hunters starting in the 1930s and escaped domestic stock. The pests also occupy the same range as whitetails, and some people are worried about that -- particularly since the state's drought is making the exploding Texas hog population more aggressive. 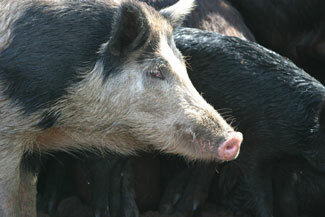 A Blanco County man was attacked by a feral hog in mid-July and more than 100 stitches were needed to close the wound. And then there's the fact that Texas' hog problem is spreading outside its borders. For example, they're now in every New Mexico county that borders Texas, and are rooting around as far west as the Rio Grande.